The 11th running of the Highway 2 McDonald's Challenge, colloquially referred to as "H2MC", took place last Saturday, March 16th in downtown Kingston. 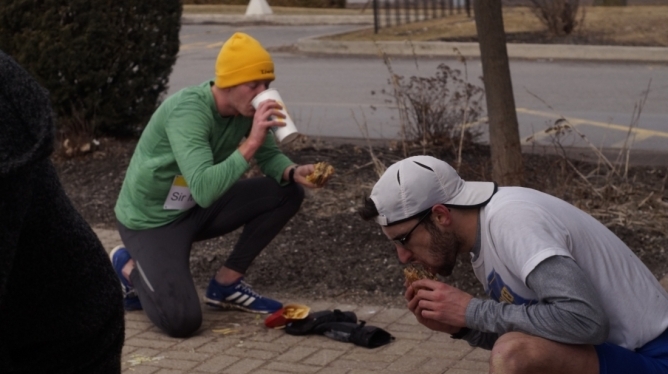 The roughly-7.5-kilometre race distinguishes itself by having participants consume a Double Big Mac meal with extra large fries and soda at the halfway point. Additionally, there is no established course to the aforementioned McDonald's, leaving participants to choose their own route to the restaurant. Similar to the beer mile, those who vomit before the finish have to complete an 800-metre penalty lap. "It wasn't a serious idea at first. I jokingly came up with it while running past [the McDonald's] one day, and thought that would be the end of it," states the event's creator, Darryl Blackport. "But once the indoor season was over, a couple of the guys [on the team] decided they actually wanted to do it." Since its inception, the event has evolved somewhat over the years. The illustrious Boyd Cup was introduced in 2013 to encourage inter-university competition, though to date only teams from Queen's and McMaster have laid claim to the prestigious award. A Waterloo chapter also existed for several years, however only the Kingston event remains today. Alex Bernst won this year's individual men's title in a scorching 30:38, the fastest time since 2016. The Queen's x-c team narrowly claimed the team title over #Q150 (rowing). Full results from this year's event are listed here: https://h2mc.wordpress.com/2019/03/16/11th-annual-h2mc-results/. Proceeds from this year's event will be donated to the Ronald McDonald House Charities. For those looking to participate in future years, the event canonically takes place on the weekend following the USports track & field championship.